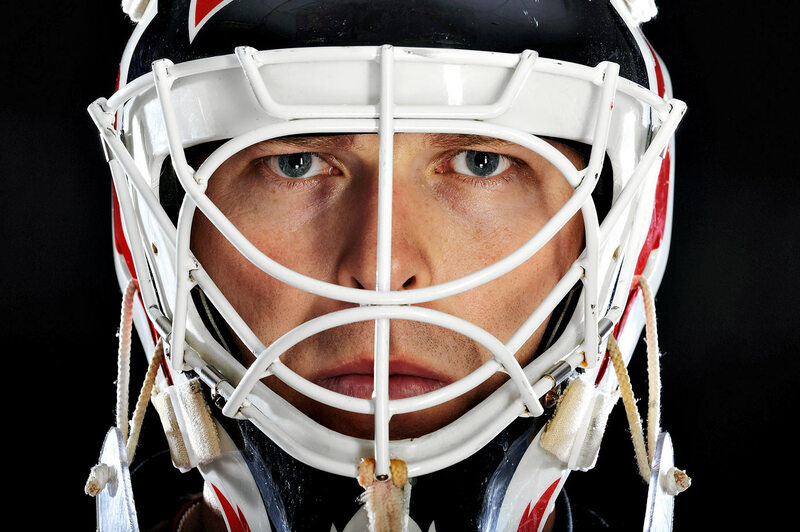 Martin Brodeur got a head start on greatness thanks to his father Denis Brodeur a Montreal Canadiens photographer and his love of goaltending: a classic Sports Illustrated story by Michael Farber. 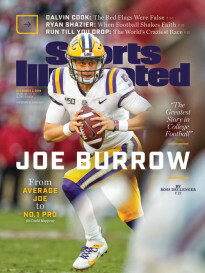 This story originally appeared in the October 6, 1997, issue of Sports Illustrated. Martin Brodeur’s boyhood bedroom in a trim house on a trim street in the Montreal suburb of St. Leonard is a shrine to goaltenders. On one wall is an action montage of Ron Hextall, Sean Burke and Patrick Roy, the NHL goalies Brodeur admired most. 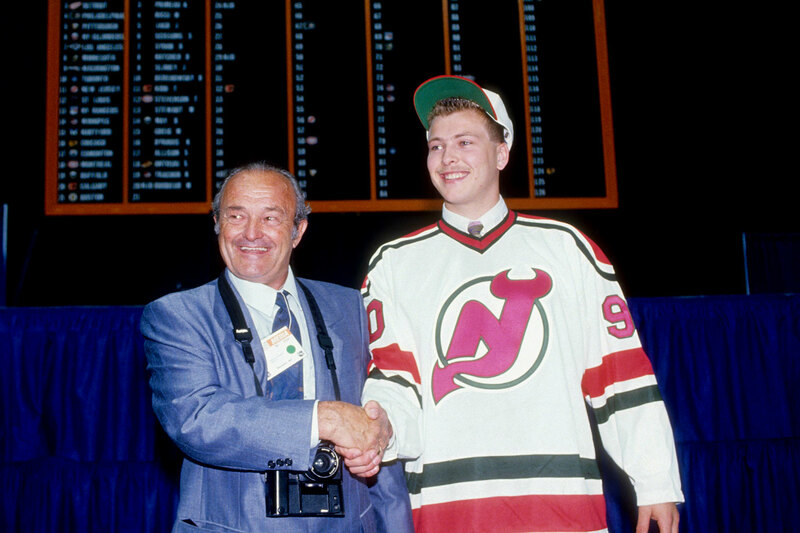 Behind the door is a picture of Brodeur, at 16, with Soviet legend Vladislav Tretiak, both of them wearing hockey gear and tight smiles at a summer goalie school. Above the bed are 1995 snaps of Brodeur and various family members with the Stanley Cup. These icons-by-Nikons are the work of a professional photographer who happened to share a bathroom with Martin. 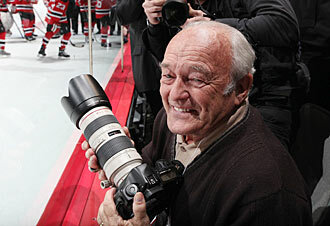 Denis Brodeur, Martin’s father, takes sports pictures for a living, which certainly has paid off for the two of them. But before f-stops came stops of a different sort for Denis. He was also an accomplished goalie, having received an Olympic bronze medal as a starter for the Canadian team at the 1956 Games. The assumption has been that the 25-year-old Martin, who is entering his fifth full season with the New Jersey Devils and who is considered the best young goalie in the NHL, inherited the puck-stopping gene from his father. Martin gives a shrug at the apple-not-falling-far-from-the-tree theory and points out that he's 6' 1" and righthanded while his father is 5' 6" and lefthanded, so the trees hardly look as if they come from the same orchard. The truth is that neither can remember skating with the other more than a few times; Martin had to learn the position without many tips from Dad. But Denis’s role in aiding Martin to reach the NHL is as undeniable as it is indirect. His profession helped light the way, although at times it was Martin who was lighting Denis’s way. Martin occasionally worked as his father’s assistant, trundling the 25 minutes from St. Leonard to the old Forum, helping with the strobes and the backgrounds, doing the heavy lifting that goes into taking photos more polished than vacation snapshots. When Martin was a promising 15-year-old goalie but a middling lighting technician, he chatted with Roy while his father did a promotional shoot involving Roy for a hamburger chain. Roy asked Martin how he was doing, but Martin couldn’t ask his idol how he was doing. In Montreal, everybody knew how Roy was doing. Still, being around the hallowed Forum was wonderful exposure for Martin. He saw the game and its people through the zoom lens of personal experience, his father’s camera having been the pass into a neighborhood in which he later would feel remarkably comfortable as a player from the start. Now Brodeur, whose 1.88 goals-against average last season was the lowest in the NHL since 1971–72, is playing with history. Of post-’67 expansion goalies only the Chicago Blackhawks’ Tony Esposito, who had 32 shutouts in his first 181 games, and the Montreal Canadiens’ Ken Dryden, who lost just 25 of his first 178 matches, have numbers as stunning for the start of a career. Even Roy, who won a Stanley Cup with Montreal in his first complete year, 1985–86, had 13 fewer victories over his first four full years than Brodeur, who won a Stanley Cup in his second full season. Among goalies who have played at least 200 games since the center red line was introduced in 1943–44, Brodeur’s 2.25 career goals-against average trails only Dryden’s 2.24. Among goalies with at least 40 playoff games, Brodeur’s 1.83 is third behind Davey Kerr, the Stanley Cup goalie for the ’40 New York Rangers, and Clint Benedict, who played the bulk of his career before talkies. While the Buffalo Sabres’ 31-year-old Dominik Hasek is the NHL’s best goalie--his spiffy .927 save percentage since 1993–94 tops Brodeur’s .915, which ranks third in the NHL during that period—Carolina Hurricanes general manager Jim Rutherford says Brodeur’s age makes him the goalie every franchise would want to build a team around. 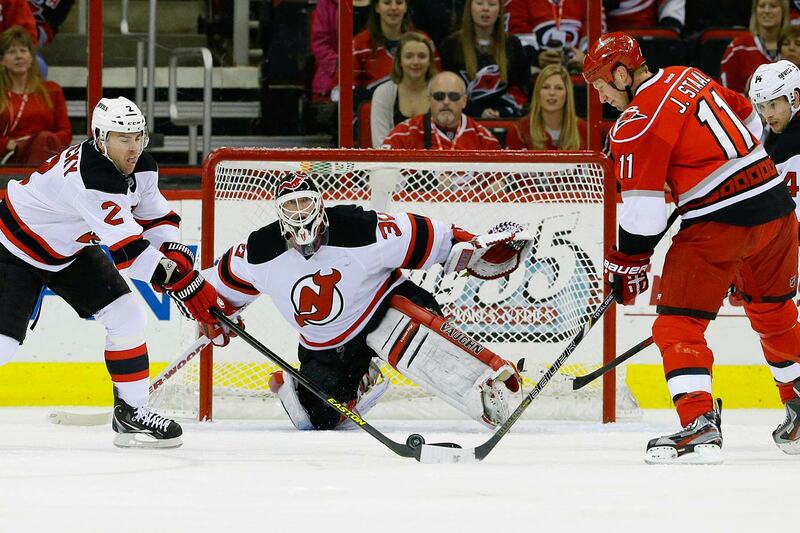 This is the New Jersey Factor, which tends to obscure rather than illuminate Brodeur’s talents. The Devils, whose discipline and constipating neutral-zone trap allowed nearly eight fewer shots per game on Brodeur than Hasek faced last season with Buffalo, can give a goalie a comfort zone, as long as he doesn’t start babbling to himself out of boredom. This is the Devils’ bargain, a cup many goalies would view as half empty. Of course, Brodeur doesn’t see it that way. Not only is his cup half full—“I’d never be a jerk with my teammates because I know I need them to be successful,” he says—but it also contains hot chocolate with miniature marshmallows. There's a dark side to Roy, a wiseacre whose blowup with former Montreal coach Mario Tremblay got Roy traded to the Colorado Avalanche in 1995. 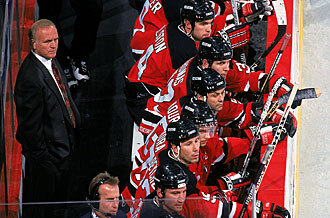 There’s a dark side to Hasek, the only Sabre who couldn’t get along with former coach Ted Nolan. But Brodeur has what his father might call natural light. He is 350 days a year of sunshine. For a goalie, says Dallas Stars defenseman Shawn Chambers, Brodeur’s road roommate with New Jersey last season, “Marty is one of the most normal guys I’ve ever been around.” This is a compliment. Two other decisions by Lemaire resonated more deeply. On Nov. 30, in New Jersey’s only visit to Colorado, Lemaire used Dunham in a 2–1 loss to Roy and the defending Stanley Cup champions. 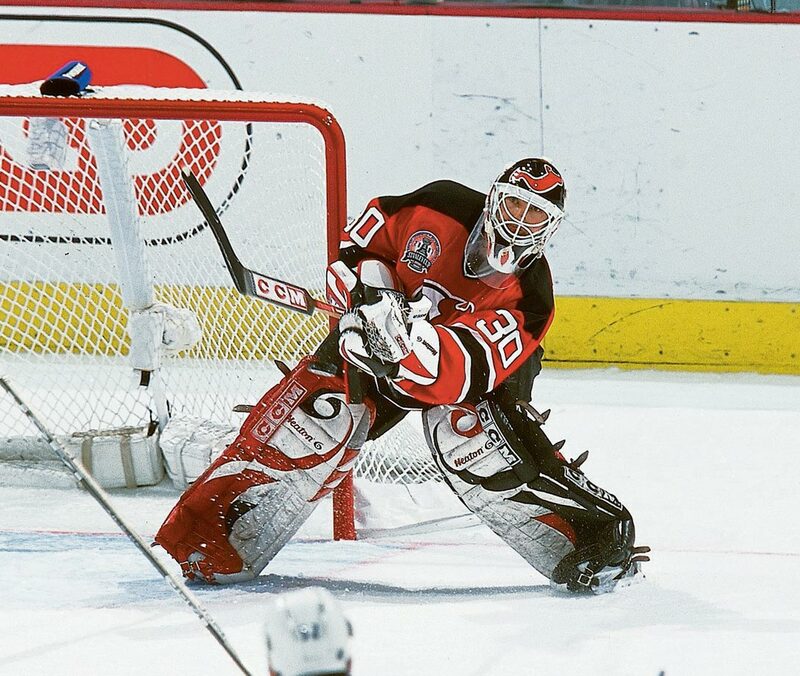 For Brodeur, who played a record 4,433 minutes in 1995–96, missing a rare matchup against Roy was like a kid being taken to the beach and being told that he couldn’t go in the water. Lemaire also chose not to start Brodeur on Feb. 1 in Montreal, a decision Brodeur didn’t learn of until a few hours before the game. He wasn’t amused. Presumably neither were the more than 20 friends and relatives for whom he had bought tickets. By denying Brodeur a mask-to-mask showdown with Roy and later a showcase game in his hometown, Lemaire was offering subtle reminders that big-time pros must put aside childhood dreams. “Yeah, not playing against Patrick and how I found out I wasn’t playing against the Canadiens upset me at the time,” Brodeur says. But no one scribbled a mustache on Lemaire’s picture in Brodeur’s boyhood bedroom (Brodeur and Lemaire posed on the day of the Quebec Major Junior Hockey League draft in 1989, when Lemaire, then the head of the Verdun Junior Canadiens, picked Brodeur in the third round), and a few days after the Montreal game, goalie and coach met on the ice during practice to clear the air. Brodeur insists the relationship has never been better. Brodeur wouldn’t say it because he has no guile, which is the part of Denis’s handiwork that you can’t frame. Martin was brought up to understand that just because you do something special doesn’t necessarily mean you are special. This makes for the most flattering portrait of all. Goaltending came naturally to Brodeur, whose father, Denis, played the position on the Canadian Olympic team that won the bronze medal in 1956. Raised in Montreal, Martin played forward as a kid—sewing the seeds of the stickhandling skills that would serve him so well in the NHL—before switching to goal at age seven. 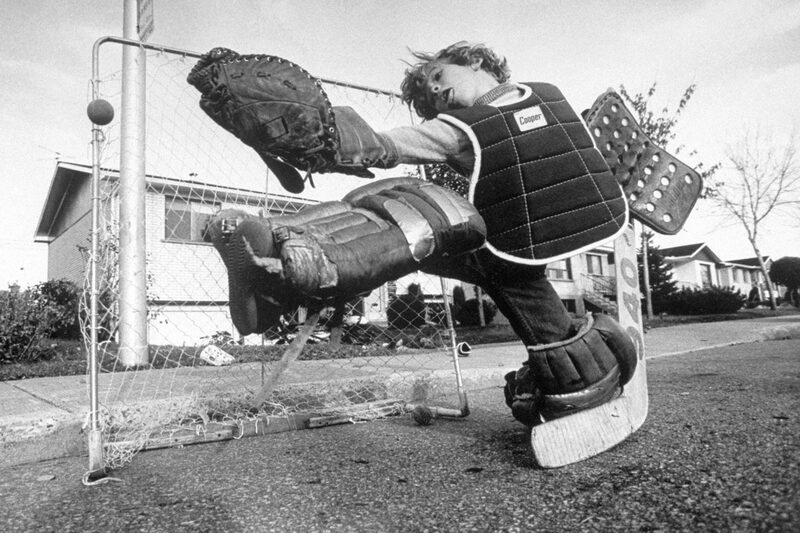 Though he idolized butterfly master Patrick Roy, Brodeur chose a standup style and developed superb mobility, instincts, positioning and puck-handling ability. 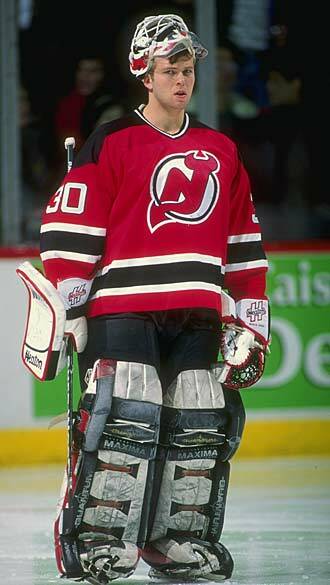 Drafted out of the Quebec Major Junior Hockey League by the Devils with the 20th pick in the 1990 draft, Brodeur made his NHL debut on March 26, 1992, with 24 saves in a 4-2 win over Boston. 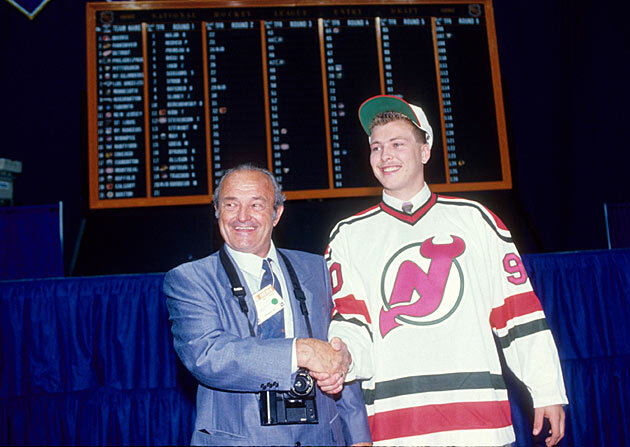 After a full season in the AHL, Brodeur was added to the Devils' opening night roster for the 1993-94 season and went on to win the Calder Trophy as Rookie of the Year with a 27-11-8 record, 2.40 GAA and three shutouts, the first of his career coming on Oct. 20, 1993 vs. Anaheim. 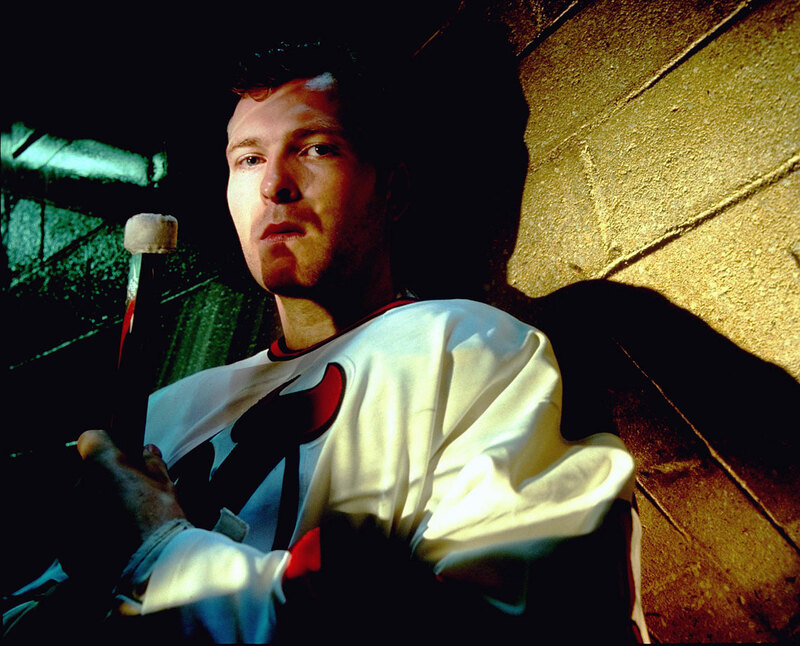 As the Devils' new starting goalie, Brodeur played in 40 of their 48 games during the lockout-shortened 1994-95 season, going 19-11-6 with a 2.44 GAA. He was brilliant in the playoffs, holding Detroit to only seven goals in four finals games as the Devils won their first Stanley Cup. 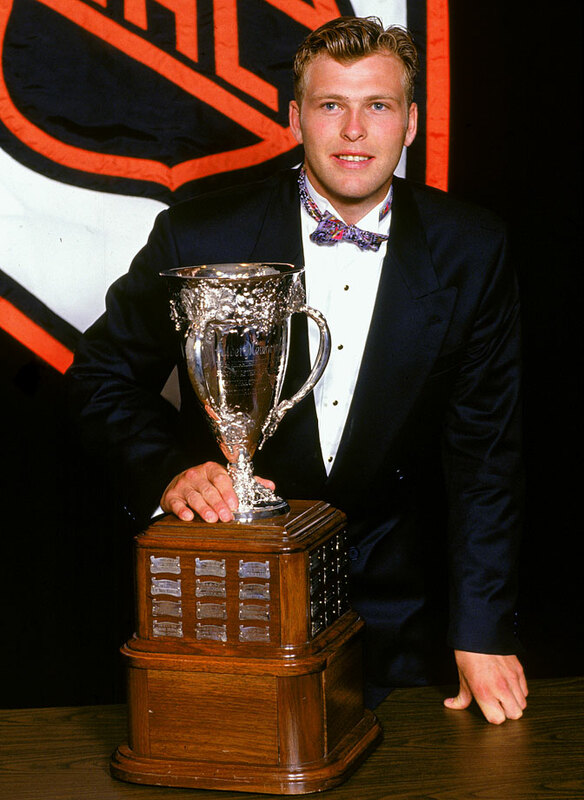 During the 1995-96 season, Brodeur went 34-30-12 with a 2.34 GAA and .911 save percentage, beginning a record streak of 12 consecutive seasons of 30 or more wins, a run that included seven with 40 or more. Blessed with a stifling defense in front of him, Brodeur led the NHL with a 1.88 GAA in 1996-97—becoming the first goaltender with a sub-1.90 since Bernie Parent of the Flyers in 1973-74. He also became the first since Montreal's Ken Dryden in 1976-77 to record 10 shutouts in a season. 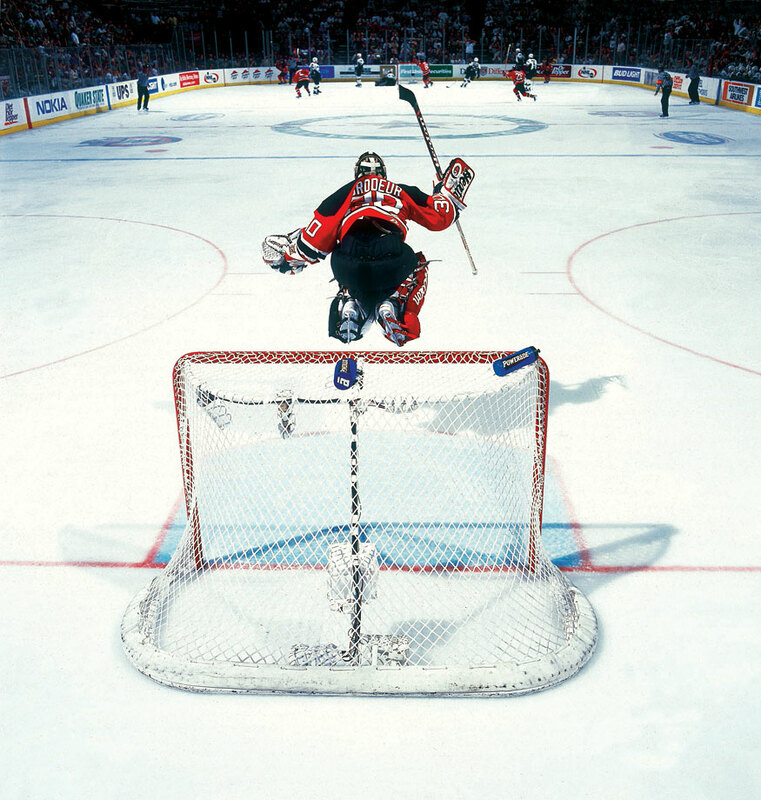 In Game 1 of the 1997 Eastern quarterfinals vs. Montreal, Brodeur joined Philadelphia's Ron Hextall as the only goaltenders to score in the postseason by shooting the puck into the net. Brodeur's prowess with the stick and fondness for roaming from his crease to play the puck led to the current "Brodeur Rule" that confines such activity by goalies to a trapezoid that is eight feet out from each goal post and 28 feet wide at the boards behind the net. 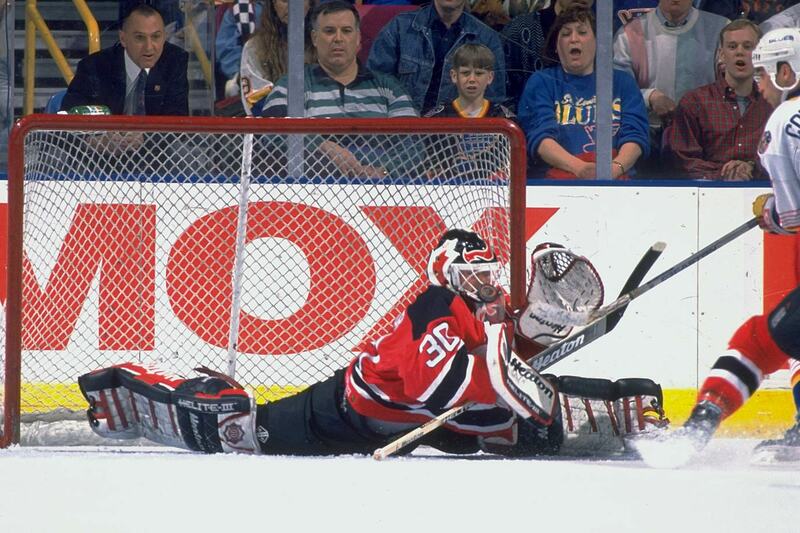 In 1997-98, Brodeur led the NHL with 43 wins and posted 10 shutouts for the second straight season. He also became only the third goaltender (along with Hall of Famers Terry Sawchuk and Harry Lumley) to have back-to-back sub-2.00 GAA campaigns. Again leading the NHL with 43 wins in 1999-2000 and tying Bernie Parent's combined mark of 59 combined regular- and postseason victories, Brodeur backstopped the Devils to their second Stanley Cup, which they won by beating the Dallas Stars in six games. 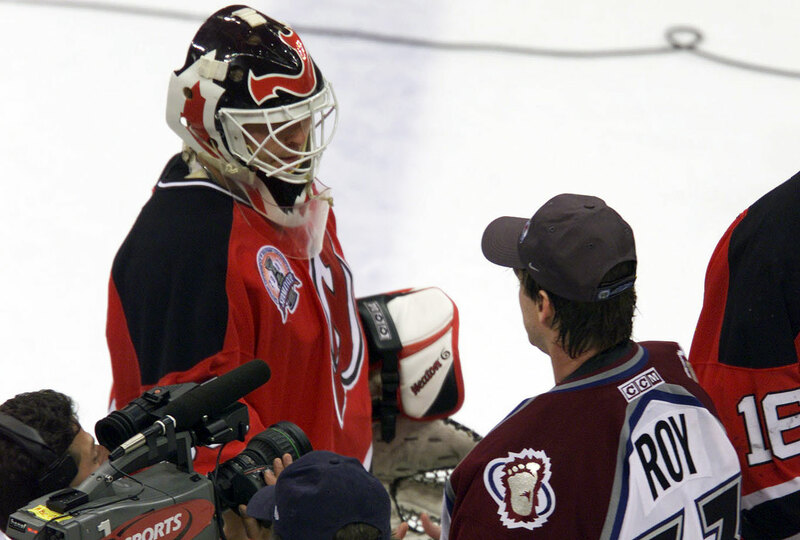 Seeking a repeat, Brodeur faced his childhood hero Patrick Roy in a memorable 2001 Stanley Cup Final, won by Colorado in seven games after the Avalanche rose from a three-games-to-two deficit. Roy denied the Devils a chance to win the Cup on home ice with a 4-0 win in Game 6, then completed the comeback with a 3-1 win in Colorado. Leading the NHL with 73 appearances in 2001-02, Brodeur became the third-fastest goaltender to reach 300 career wins when he beat Ottawa 2-0 on Dec. 15, 2001. Like his father, Martin has represented Canada in international play, most notably winning the gold medal at the 2002 Winter Games in Salt Lake City after posting a 4-0-1 mark with a 1.80 GAA in the tournament. It was the second of his four Olympic stints (he did not see action in 1998). 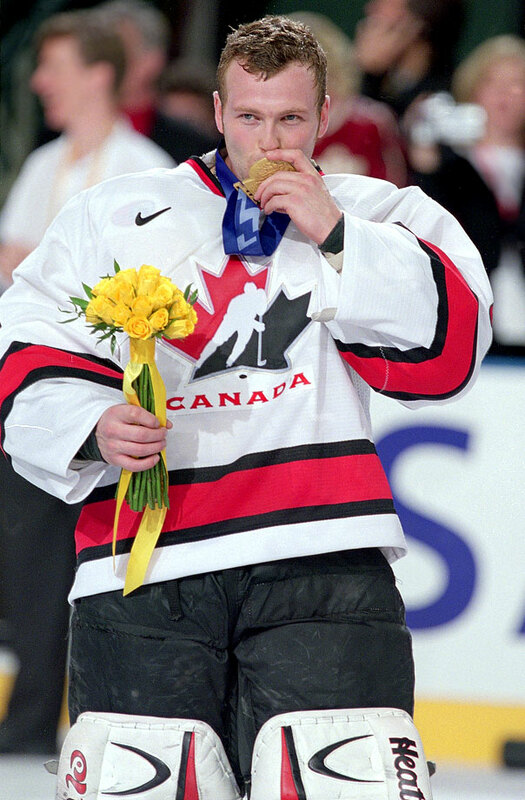 He was also a member of Canada's 1996 and 2005 World Championship teams and '97 and '05 World Cup teams. 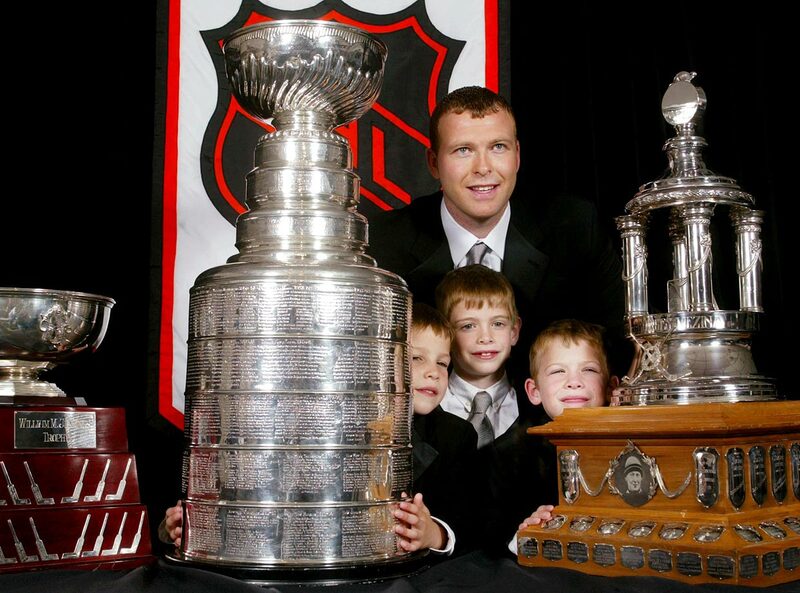 Brodeur, seen here with sons Jeremy, Anthony and William, won his first Vezina Trophy for a 2002-03 campaign in which he became the first NHL netminder to have four 40-win seasons (surpassing Sawchuk and Jacques Plante). 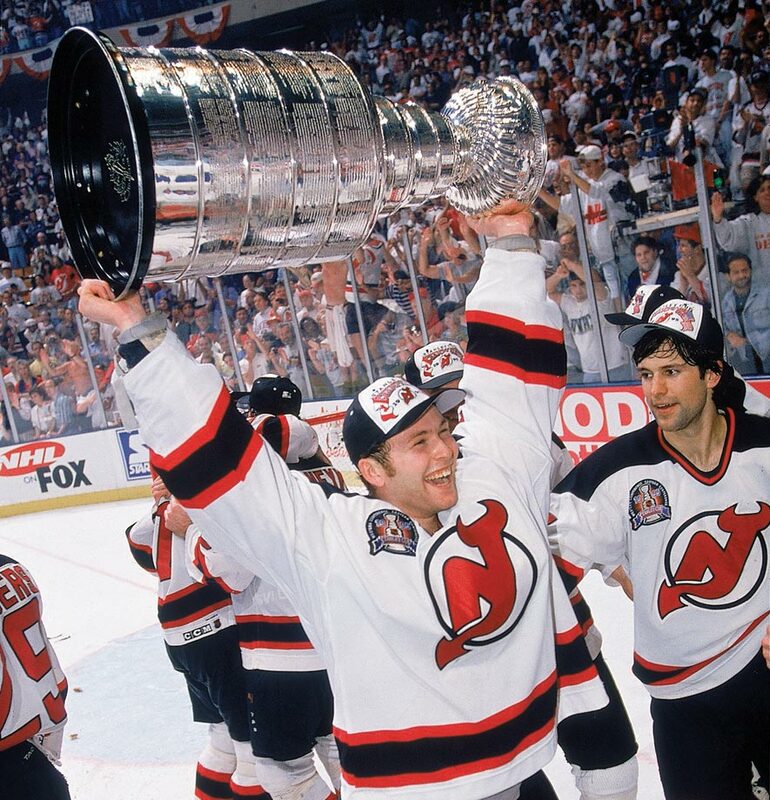 He was a complete miser in the postseason, setting an NHL mark of seven shutouts, including three vs. Anaheim in the finals, as the Devils won their third Stanley Cup. 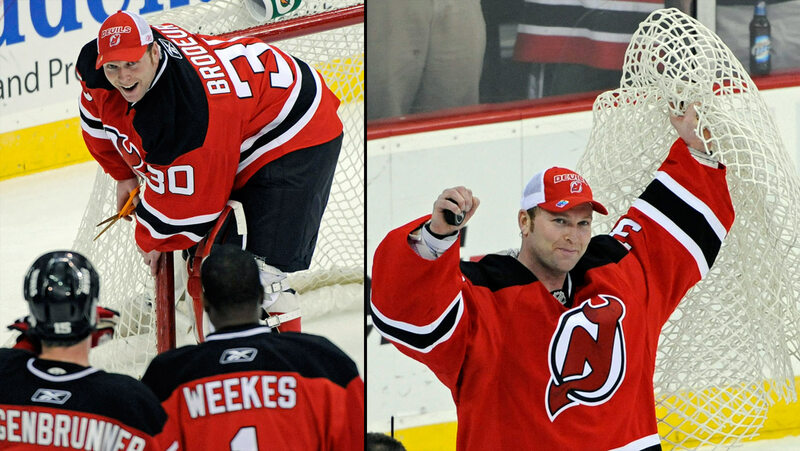 Setting a single-season record of 48 wins in 2006-07, Brodeur won his third Vezina while also posting 12 shutouts. 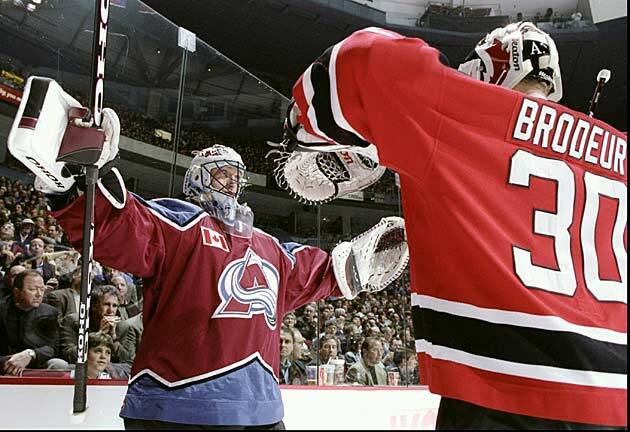 On Nov. 17, 2007, Brodeur beat Philadelphia 6-2 to join Patrick Roy as the only members of the NHL's 500-wins club. His overall mark of 44-27-0-6, 2.17 GAA and four shutouts earned him his fourth Vezina in five seasons. 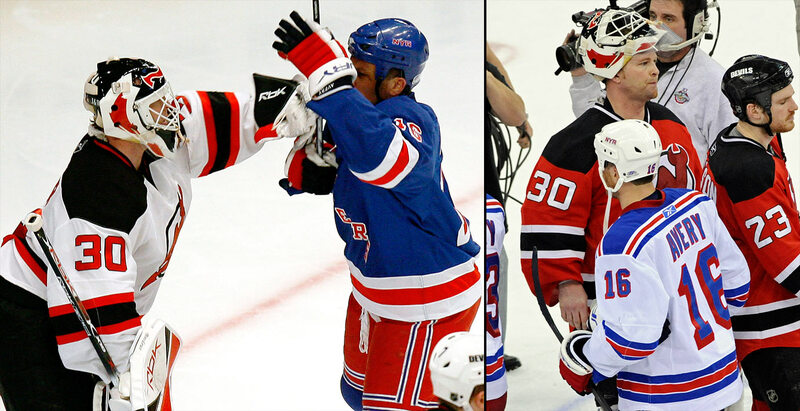 Again playing a role in the creation of a rule, Brodeur saw his rivalry with Sean Avery bubble over in Game 3 of the 2008 Eastern quarterfinal when the Rangers agitator stood waving his stick in the goaltender's face—this after Avery's two interference penalties in the series. 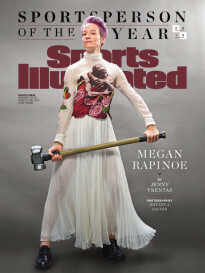 The NHL was moved to instantly invoke an "Avery Rule" prohibiting such antics. After the Rangers eliminated the Devils in five games, Brodeur snubbed Avery in the handshake line, leading Avery to famously remark "I guess fatso forgot to shake my hand." With anticipation building for his assault on Roy's career wins mark, Brodeur suffered a tear of the biceps tendon in his left elbow on Nov. 1, 2008, ending his streak of 70-plus-game seasons at 10. Returning to action on Feb. 26, 2009, he picked up where he left off with a 4-0 shutout of Colorado in which he made 24 saves. 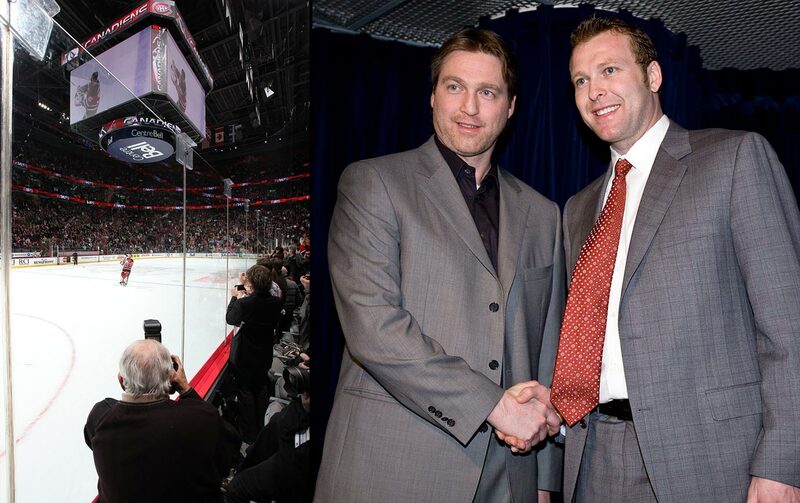 Brodeur joined Patrick Roy atop the NHL's victories list with a 3-1 win over the Canadiens on March 14, 2009. The night was made even sweeter because it came in Montreal, with his father (pictured w/camera) and Roy looking on, the banner bearing the former Canadien's recently-retired number (33) hanging over him, and the sell-out crowd chanting Brodeur's name. 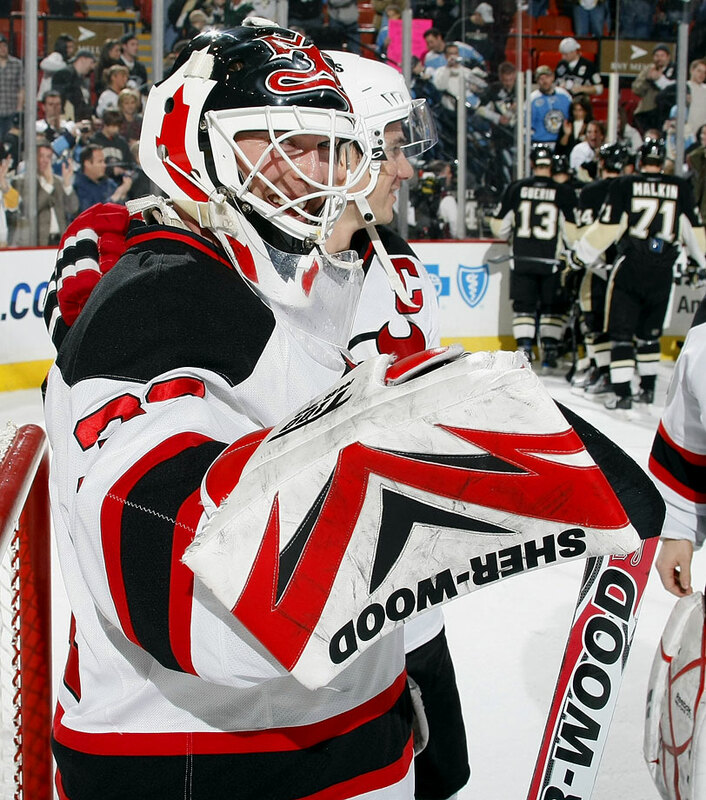 On December 12, 2009 Brodeur reached yet another milestone when he shuts out Penguins 4-0, breaking Terry Sawchuk’s career NHL shutout record of 103. Nine days later the Devils legend blanked the Pens yet again to shatter George Hainsworth’s pro record of 104 pails of whitewash. By blanking the Thrashers 3-0 at the Philips Center in Atlanta on April 6, 2010, Brodeur became the first NHL goalie to reach the 600-wins mark. The victory, his league-leading 43rd of the season, also extended his career shutout mark to 110. 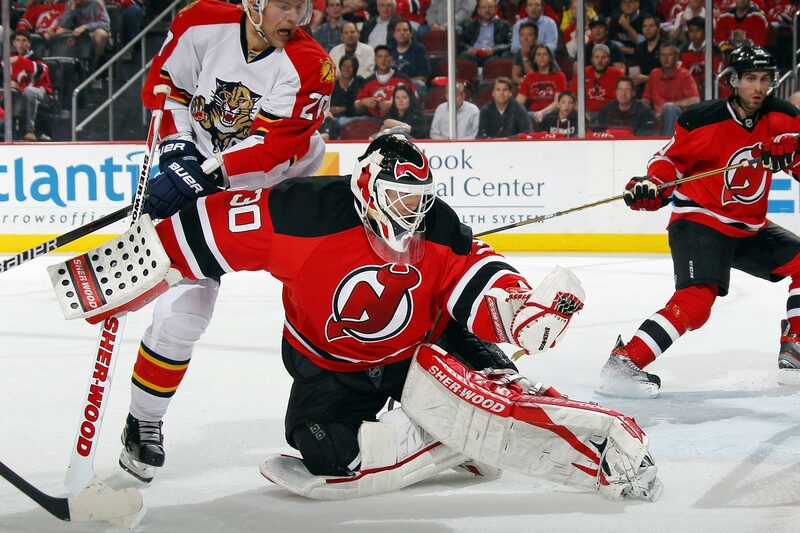 Coming off his 14th and final 30-win regular season, Brodeur blanked the Florida Panthers, 4-0, in Game 4 the 2012 Eastern Conference quarterfinals on April 19 to break Patrick Roy's career postseason shutout mark (23) and become only the second goaltender to reach 100 playoff wins. 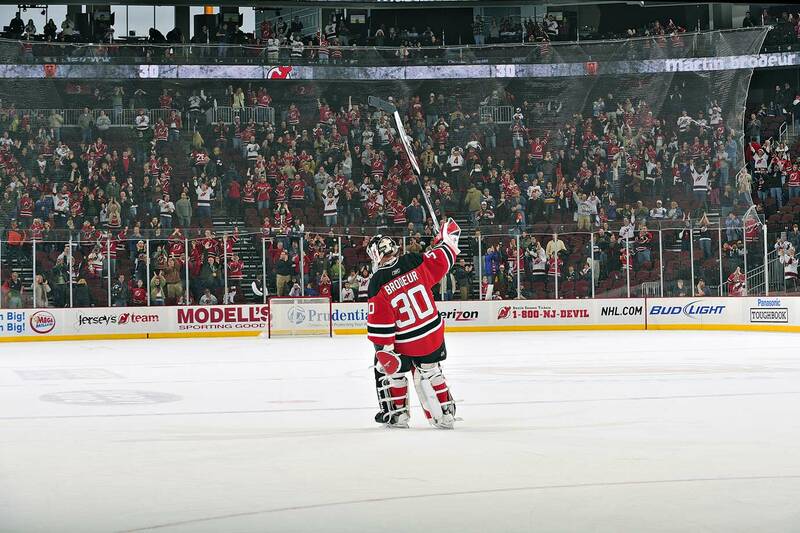 On May 25, 2012, the Devils beat the Rangers 3–2 thanks to Adam Henrique's goal in overtime, sending Brodeur to his fifth Stanley Cup finals appearance. New Jersey lost to the Los Angeles Kings in six games in what would turn out to be the 17th and final postseason of his career. After missing a month of action due to a nerve injury in his back, Brodeur returned to the net on March 21, 2013 with some of his old stick magic, scoring a power play goal against the Carolina Hurricanes that made him the only NHL goalie to record three career tallies, and the second after Evgeni Nabokov of the Sharks to light the lamp with the man advantage. 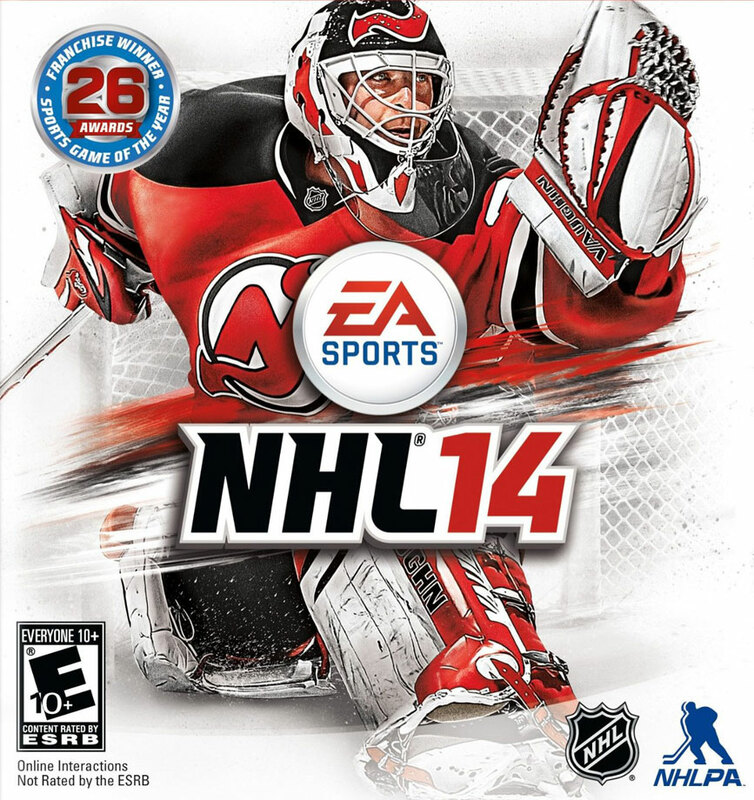 After defeating Blue Jackets goalkeeper Sergei Bobrovsky in an online vote in June 2013, Brodeur won the honor of being the cover athlete on EA's NHL 14 video game. 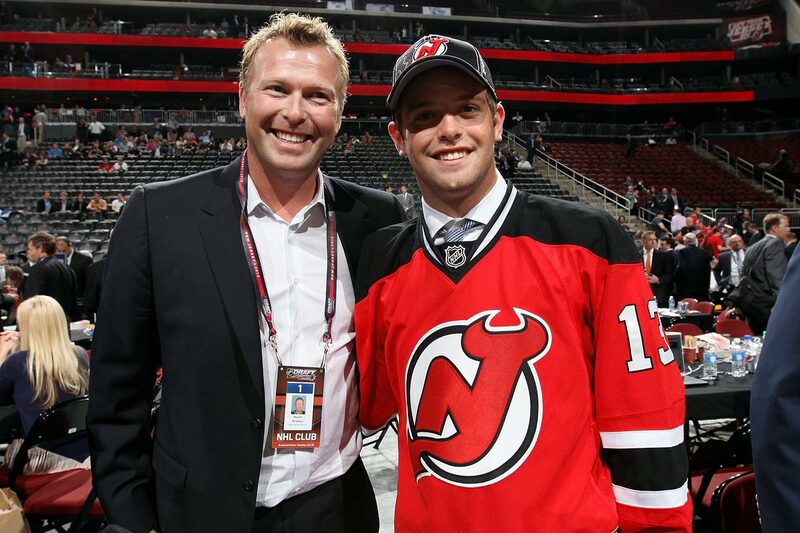 After the Devils acquired the 208th pick in the 2013 NHL Draft from the Kings, Brodeur was given the very special privilege of making the announcement that New Jersey had selected his son, Anthony, 18, a goalie out of Minnesota's Shattuck-St. Mary's prep school, in the seventh and final round. 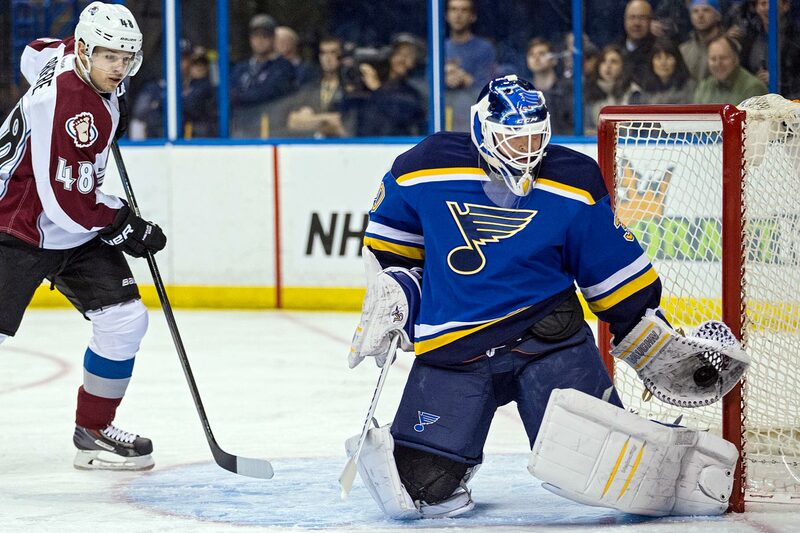 Unsigned as a free agent, Brodeur inked a one-year, $700,000 deal with the injury-plagued St. Louis Blues on Dec. 2, 2014. He concluded his legendary career with seven appearances, a 3-3-0 record, .899 save percentage and 2.87 GAA. On Jan. 29, 2015, he announced his retirement as the NHL's all-time leader in games played by a goalie (1,266), saves (28,928), wins (691), shutouts (125), and playoff shutouts (24).